Located just above a small leisure Marina on the Balearic island of Mallorca, in the Mediterranean Sea - with a sandy beach literally just steps away, there is a Hotel which bathes in the reflected light and colours of the blue sea and sky, verdant nature, and the glowing red horizon of the evening setting sun. 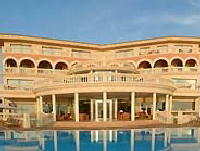 All the 68 spacious rooms and suites of the hotel have full sea-view and have been designed with maximum comfort in mind. Each has independent temperature controls, a fully-equipped bathroom with separate shower and WC, a telephone, a hair dryer and bathrobes. All rooms and suites have satellite TV, fax and Internet connections, a mini-bar, and a safety deposit box. At PortAdriano you can choose between two different styles of Restaurant. The Vela Restaurant offers magnificent breakfasts and delightful and healthy a la carte lunch menus changed daily according to season.